So here I am back in the UK on my travels spending a fabulous day at the Raymond Blanc Cookery School. Some of you may have read my blog back at the beginning of last October when Bob and I went to our favorite restaurant – the Manoir Aux Quat’Saisons just outside Oxford. I was shown around the kitchens after our meal by Gary Jones the executive chef there and saw the cookery school. I vowed then that I would definitely do a course and here I am with my great friend Jane Bower learning about Food, Body and Mind – which actually really means looking at good nutrition. Jane and I carefully making Vietnamese summer rolls ! The rules of good nutrition do not exclude eating and more importantly cooking delicious food – finding the freshest ingredients available, reducing the amount of sugar and salt in the foods we eat and cook with, making sure that we have plenty of varied fruit and vegetables in our diet – all basic easy tips that were demonstrated in the food we cooked. Natalia Traxel – a doctor – is the beautiful and elegant nutritionist who co- hosts the course and shared in a very accessible way her vast knowledge of the does and don’t’s associated with healthy eating and top quality cooking. I have always wanted to learn how to cook poached eggs like a professional – and that was one of the first things we did – serving the eggs with a quickly cooked tomato fondue….. I baked a loaf of bread !! – I have tried to make it before in a bread machine and it was awful – like a brick. But the cereal bread we made was great – hand kneaded and pummeled and really delicious. 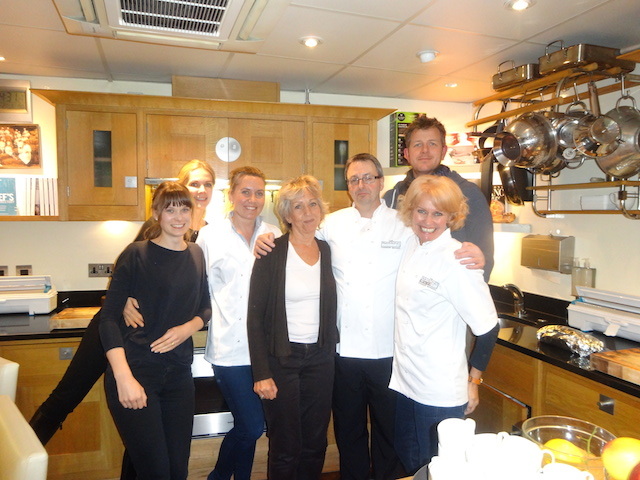 The cookery school director – Mark Peregrine – was skillful , knowledgable and fun ! and most importantly inspirational – he has many entertaining anecdotes which he drops in while he is whipping up the most tasty food imaginable. He is generous with his knowledge and makes it feel very safe to try your hand at things you would normally avoid – well I would anyway ! Cookery school director Mark Peregrine with Rebecca – another teacher on the course. There were six of us on the course and we all very much enjoyed each other’s company. We tasted everything that both Mark and we ourselves cooked. For lunch we made chicken cooked in red wine vinegar with quinoa on the side – I thought this sounded a bit weird but it was simply delicious. As a starter Rebecca taught us how to make Vietnamese summer rolls with dipping sauces – chopped fresh vegetables wrapped in rice flour wrappers – eaten raw…. Our group minus one ! Mark made a fantastic watercress soup – and a creme caramel with no cream in it. Then we all made a chocolate mousse with just chocolate and eggs. After lunch we had a tour of the gardens – nothing really growing there in the depths of a cold February but it was interesting to see all the beds laid out – and the very pretty mushroom growing area as well. View of the beautiful main house at the Manoir Aux Quat’Saisons and the vegetable garden – well it is February ! Then into the covered areas to see all the micro greens used for garnishing the dishes – and a sneaky taste of some of them. Best of Eleuthera – Eleuthera All That Jazz….. The mushroom garden sunken as it is – would love to spend time there! Now that’s a “chef’s training” indeed and you will always enjoy the benefits. Yes – I am looking forward to being able to show off the skills I learned …..